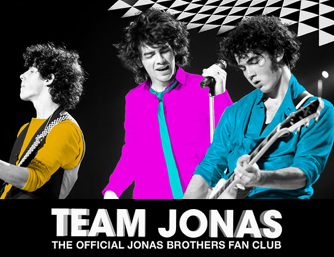 Team Jonas is an online interactive community for fans of the Jonas Brothers. It hosts forums, contests, exclusives and more. The Team Jonas PLUS Membership gets you an exclusive Fan Club Gift Pack, a CD copy of their upcoming Hollywood Records release and an exclusive bonus DVD (upon release in 2008), plus full access to all areas of the Team Jonas Fan Club site including the Community area where you can interact with other Jonas Brothers fans. You can also participate in exciting members-only contests and get exclusive presale access to Jonas Brothers concert tickets. You must live in the United States, Puerto Rico or Canada to qualify for this offer. For those outside of the US and Canada, Team Jonas provides an international membership for 5 dollars more than the Team Jonas Premium Plus membership. It includes everything seen with the Team Jonas Premium Plus membership as well. There are currently about 25,000 members with an average of 43.59 members joining per day. In March, 16691 people registered. And as of July 4th, 250 members have registered for this month. The most members ever online was 881 on March 24, 2008, at 07:50:56 PM. An average of 100 members frequent the site daily. In March of 2008, the Team Jonas website offered a "pre-sale" exclusive to it's members to buy Jonas Brothers concert tickets online through Ticketmaster.com before the general public. You, the member, would select which concert you wanted to attend and Team Jonas would issue a custom ID number for you to enter into Ticketmaster to receive your tickets early. The limit was 4 tickets per member. A lot of members got fairly close tickets in the "floor" sections of the concerts, but most ended up with upper level or otherwise undesirable seats. Outraged, these members protested Team Jonas claiming that they were promised good tickets when they paid for their membership, but did not receive them. Team Jonas replied to these posts that they promised a pre-sale only and did not have anything to do with the quality of the tickets received once the ID number was issued. Also, due to high traffic to the Team Jonas website caused by members applying for their ID numbers, a lot of members couldn't even gain access to the site or the tickets. A new system for pre-sales was designed by Team Jonas following. Another complaint with Team Jonas was members saying that they were originally offered exclusive Meet and Greet (or M&G) passes when they signed up. Again, Team Jonas denied ever stating that, but instead saying that the members would have access to M&G contests in which everyone who entered would have an equal chance of getting the passes. In late June, the Moderators and Team Jonas declared their first M&G pass contest in which the members would sign up for a chance to win one pass for one concert he/she was planning to attend. Only one entry was allowed per person and entering more than once would disqualify one from the contest. Team Jonas would phone winners a few days prior to the concert the contestant signed up for.